Ferrous Sulfate is the main source of natural iron supplement which the main physical form are Ferrous Sulfate Monohydrate and Ferrous Sulfate Heptahydrate,and the main uses in food industry is to as the iron fortifier and fruit and vegetable colorant. 2.Molecular Formula : FeSO4·7H2O, FeSO4·nH2O. 4. CAS No. : Heptahydrate: 7782-63-0; Dried: 7720-78-7. 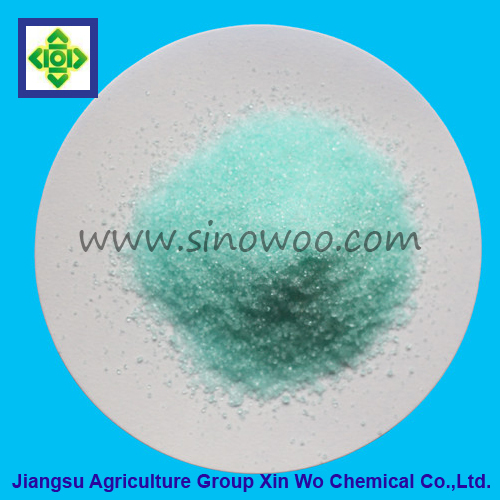 5.Character: Heptahydrate: It`s blue-green crystals or granules, odorless with astringency. In dry air, it`s efflorescent. In moist air, it oxidizes readily to form a brown-yellow, basic ferric sulfate. It`s soluble in water, insoluble in ethanol. 6.Usage: It is used as nutritional supplement(iron fortifier) and fruit and vegetable colorant.Besides food industry, ferrous sulfate can also be as iron fortifier for feed additives,and applied for the purification of water, be used to stain concete and some limetones and sand stones a yellowish rust color. 7.Packing: It is packed with polyethylene bag as inner layer, and a compound plastic woven bag as outer layer. The net weight of each bag is 25kg. 8.Storage and Transport: It should be stored in a dry and ventilative warehouse, kept away from heat and moisture during transportation, unloaded with care so as to avoid damage. Furthermore, it must be stored separately from poisonous substances. Looking for ideal Ferrous Sulfate Monohydrate Manufacturer & supplier ? We have a wide selection at great prices to help you get creative. All the Ferrous Sulfate Heptahydrate are quality guaranteed. We are China Origin Factory of Natural Iron Supplement. If you have any question, please feel free to contact us.